Pre-heat oven to 170°C/ 350°F. Distribute shredded coconut over baking sheet evenly and roast in oven for approx. 4 min., or until golden brown. In a large bowl, beat egg whites, sugar, vanilla extract and salt. Add toasted coconut and combine. Cover bowl with plastic wrap and place in fridge for approx. 1 hr. Form coconut mix into 20 small balls and distribute over a parchment-lined baking sheet. Transfer to oven at 170°C/350°F for approx. 15 min. The macaroons should be lightly browned and still a bit soft. Take out of oven and set aside to cool. Break up chocolate and melt in a heatproof bowl set over a pot of simmering water. 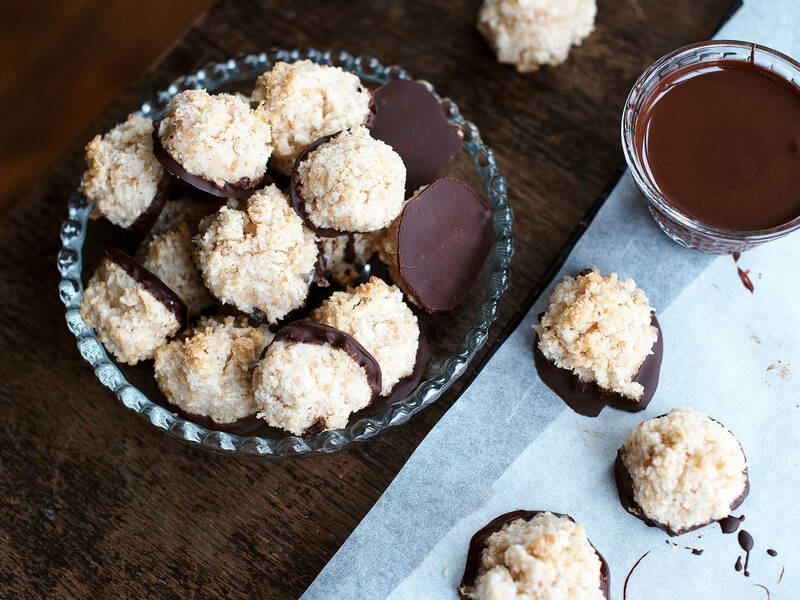 Carefully remove macaroons from baking paper and partially dip in chocolate. Place on parchment paper to dry for approx. 1 hr., then enjoy!